As we approach the new school year, parents are taking steps to ensure that their little ones are well-prepared and cared for. Enrollment forms, immunizations, new clothes and school supplies are on everyone’s checklist. However, it’s important to add a new item to the list: their eye health. In observance of Children’s Eye Health & Safety month, we encourage all parents to set up an eye exam to ensure that there are no potentially dangerous issues that have gone unseen and untreated. Even outside of the eye doctor’s office, there are some simple steps to take to keep eyes safe and healthy. 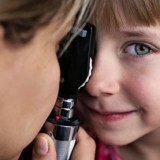 Many parents may think that eye exams are for older children or teenagers. However, the American Optometric Association recommends that regular kids’ eye exams should begin as early as six months of age. This is especially true for children who are considered “at risk” for certain eye conditions. In these cases, more frequent checkups may be recommended by a professional. Especially in children who are too young to speak and communicate issues, it may be difficult for parents to decipher potential vision issues. This is why it’s important to monitor children and schedule an appointment with a professional when any potential warning signs are observed. These warning signs may include frequent eye-rubbing, squinting when trying to read or see objects, head-tilting or turning when looking at objects, and wandering eyes – to name a few. If your child has experienced complications due to retinoblastoma, despite your best efforts to prevent them, call us at 407-244-3000 to discuss your potential legal options.